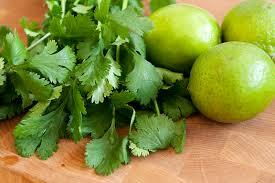 In a small bowl, whisk lemon juice, melted coconut oil, sea salt, pepper and cilantro; pour over salad greens. Add optional pumpkin and sesame seeds for a nice healthy crunch. Dress salad, toss and enjoy. Serve dressing chilled.